Nikolai Mikhailovich Karamzin portrait painted by Vasily Andreyevich Tropinin. Nikolai Mikhailovich Karamzin (Russian: Никола́й Миха́йлович Карамзи́н) (December 1, 1766 – June 3, 1826) was perhaps the most important Russian writer prior to Pushkin. He played a significant role in the reformation of the Russian literary language, preferring the easy style of French literature to the more dense Slavonic. In this regard, Karamzin was an important influence on Pushkin, the first acknowledged master of modern Russian literature, and the father of the Russian literary language. He authored the most important Russian travelogue, Letters of a Russian Traveler, and was justly called the first Russian literary critic as well. In his later career he turned to writing history. He is best remembered today for his History of the Russian State, a 12-volume national history modeled after the works of Gibbon. Karamzin was born in the village of Mikhailovka, in the government of Orenburg on the 1st of December (old style) 1765. His father was an officer in the Russian army. He was sent to Moscow to study under Professor Schaden, and then on to Saint Petersburg. He became part of the Novikov group and made the acquaintance of Dmitriev, a Russian poet of some merit, and occupied himself with translating essays by foreign writers into his native language. He also met Jakob Michael Reinhold Lenz, the German Storm and Stress poet there. After residing some time in St. Petersburg, he went to Simbirsk, where he lived in retirement until he was induced to revisit Moscow. There, in the midst of the society of learned men, he again took up literary work. In 1789 he resolved to travel, visiting Germany, France, Switzerland, and England. On his return he published his famous Letters of a Russian Traveler, which met with great success. These letters, modeled after Sterne's Sentimental Journey, were first printed in the Moscow Journal, which he edited, but were afterwards collected and issued in six volumes (1797–1801). They represented the most important source of information about the West for decades. He was particularly interested in German philosophy and literature, interviewing Immanuel Kant and Johann Gottfried von Herder among others. During this period, Karamzin was a "Westernizer," that is, one of those Russians who believed that Russia's future lay in adopting Western political institutions and integrating Russian culture into Western culture. 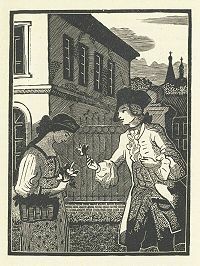 In the same periodical Karamzin also published translations from French, and some original stories, which include Poor Liza and Natalia the Boyar's Daughter (both 1792). These stories introduced Russian readers to sentimentalism, and Karamzin was hailed as "a Russian Sterne," but their quality does not correspond to their influence. Liza was a stock figure from German poetry but did not translate well into the Russian setting. Fyodor Dostoevsky would make fun of Karamzin's sentimentalism in his Notes from Underground, among others. His heroine, also named Liza, is the "good-hearted prostitute" of sentimentalism, but is tormented by the quick-witted, cynical Underground man. In 1794 he abandoned his literary journal, publishing instead a miscellany in two volumes, entitled Aglaia, in which appeared, among other pieces, The Island of Bornholm and Ilya Muromets, a story based upon the adventures of the well-known hero of many a Russian legend. In 1797–1799 he issued another miscellany or poetical almanac, The Aonides, in conjunction with Gavrila Romanovich Derzhavin and Dmitriev. In 1798 he compiled The Pantheon, a collection of pieces from the works of the most celebrated authors, ancient and modern, translated into Russian. Many of his lighter productions were subsequently printed by him in a nice volume entitled My Trifles. Admired by Alexander Pushkin and Vladimir Nabokov, the style of his writings is elegant and flowing, modeled upon the easy sentences of the French prose writers rather than the long periodical paragraphs of the old Slavonic school. In 1802 and 1803 Karamzin edited the journal European Messenger (also translated as Herald of Europe). It was not until after the publication of this work that he realized where his strength lay, and commenced his History of the Russian State. In order to accomplish the task, he secluded himself for two years; when his retirement became known to the emperor Alexander, Karamzin was invited to Tver, where he read to the emperor the first eight volumes of his history. During this period, in an essay on Peter the Great, Karamzin abandoned his earlier Westernizing sympathies, focusing on the importance of Russia's Slavic roots and traditions. He criticized Peter for his Westernizing reforms a century earlier, which he felt deprived Russia of its own unique traditions, although he recognized that there was no returning to the previous state of affairs. In 1816 he removed to St. Petersburg, where he spent the happiest days of his life, enjoying the favor of Alexander, submitting to him the sheets of his great work, which the emperor read over with him in the gardens of the palace of Tsarskoye Selo. He did not, however, live to carry his work further than the eleventh volume, terminating it at the accession to the throne of Michael Romanov in 1613. He died on the 22nd of May (old style) 1826, in the Taurida palace. A monument was erected to his memory at Simbirsk in 1845. As an historian Karamzin has deservedly a very high reputation. Until the appearance of his work, little had been done in this direction in Russia. The preceding attempt of Tatishchev was merely a rough sketch, inelegant in style, and without the true spirit of criticism. Karamzin was most industrious in accumulating materials, and the notes to his volumes are mines of curious information. Perhaps Karamzin may justly be censured for the false gloss and romantic air thrown over the early Russian annals; in this respect he reminds us of Sir Walter Scott, whose writings were at this time creating a great sensation throughout Europe, and probably had their influence upon him. Karamzin appears openly as the panegyrist of the autocracy; indeed, his work has been styled the "Epic of Despotism." He does not hesitate to avow his admiration of Ivan the Terrible, and considers him and his grandfather Ivan III as the architects of Russian greatness, a glory which in his earlier writings, perhaps at that time more under the influence of Western ideas, he had assigned to Peter the Great. In the battle-pieces we find considerable powers of description; the characters of many of the chief personages in the Russian annals are drawn in firm and bold lines. As a critic Karamzin was of great service to his country; in fact, he may be regarded as the founder of the review and essay (in the Western style) among the Russians. Also, Karamzin is sometimes considered to be a founding father of Russian conservatism. Upon appointing him a state historian, Alexander I highly valued Karamzin's advice on political matters. His conservative views were clearly expounded in The Memoir on Old and New Russia, written for Alexander I in 1812. This scathing attack on reforms proposed by Mikhail Speransky was to become a cornerstone of official ideology of imperial Russia for years to come. The conservatism of Alexander's later years can in part be traced by Karamzin, although the effects of the Napoleonic wars on Alexander cannot be underestimated. Что наша жизнь? – роман. Кто автор? – анон. Читаем по складам, смеемся, плачем... спим. What is our life? – a novel. Who is its author? – Anonymous. We spell it out falteringly, laughing, weeping... then fall asleep. Black, J. L., ed. 1975. Essays on Karamzin: Russian Man-of-Letters, Political Thinker, Historian, 1766–1826 (Slavistic Printings and Reprintings; 309). The Hague, Paris: Mouton & Co.
Grudzinska Gross, Irena. 1991. "The Tangled Tradition: Custine, Herberstein, Karamzin, and the Critique of Russia." Slavic Review 50, No. 4 (Winter), pp. 989–998. Karamzin, N. M. 1969. Selected Prose of N. M. Karamzin. Trans. and Intr. by Henry M. Nebel, Jr. Evanston, IL: Northwestern University Press. Nebel, Henry M., Jr. 1967. N. M. Karamzin: A Russian Sentimentalist. The Hague: Mouton & Co.
All links retrieved December 4, 2018. This page was last modified on 4 December 2018, at 17:53.